Incoming CHS Students: Live & Learn on Campus! Admission to the UK IHRC LLP is highly competitive! Learn more & apply here. The Interprofessional Healthcare Residential College (IHRC) is a high-impact, living-learning program designed for highly-motivated students who have a passion for healthcare. The IHRC is the perfect way to immerse yourself in healthcare. Through connected coursework and co-curricular activities, students in the program enjoy an array of benefits, including smaller class sizes and enhanced study groups. IHRC students also gain special access to unique, healthcare-related opportunities, including undergraduate research, service-learning, and ongoing networking opportunities with faculty and clinicians as well as a dedicated team of live-in peer mentors. The IHRC open to every major on campus as well as new and returning students. College of Dentistry, College of Medicine, College of Health Sciences, College of Nursing, College of Pharmacy, College of Public Health, College of Social Work, College of Agriculture, Food, and Environment (Department of Dietetics and Human Nutrition), and College of Communication and Information. 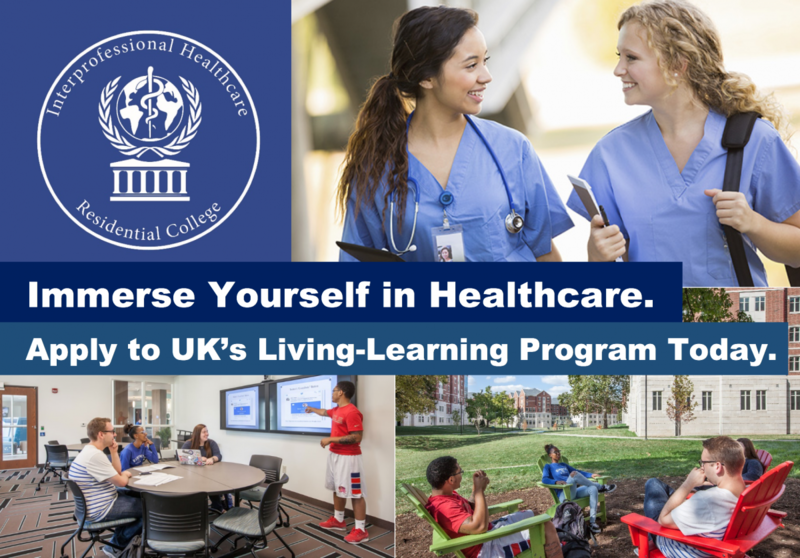 The Living Learning Program application is a part of your UK Housing application. The application opens September 1 and closes May 1. We encourage you to apply early and emphasize your passion for being part of a community of healthcare scholars in your essay. Spaces fill quickly, so apply today. Don’t miss your chance to be included! Click here to visit the UK Living Learning Program website.